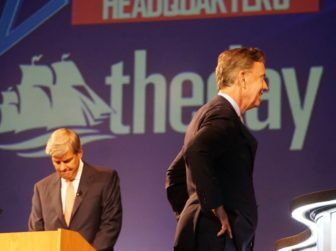 Ned Lamont and Bob Stefanowski during a break at a debate. A Quinnipiac University poll of likely voters released Tuesday shows Democrat Ned Lamont’s lead over Republican Bob Stefanowski has shrunk by half to four percentage points in Connecticut’s gubernatorial race and now sits precariously within the margin of error. Lamont leads Stefanowski 47 percent to 43 percent, with petitioning candidate Oz Griebel at 7 percent. Voters preferring Lamont have not moved since the last Quinnipiac poll on Oct. 10, while Stefanowski has gained four points. Griebel had 11 percent in the previous poll. “This race is looking a lot like the last two elections for governor in Connecticut — a real nail-biter,” said the poll’s director, Douglas Schwartz. U.S. Sen. Chris Murphy, a Democrat seeking a second term, leads Republican Matt Corey, 56 percent to 41 percent, maintaining his 15-point lead from 20 days ago. A Sacred Heart University and Hearst Connecticut Media Group survey released on Oct. 23 also showed Lamont with a lead within the margin of error in the open race for governor. The Quinnipiac poll’s release comes as the gubernatorial candidates prepare to debate tonight for the final time in the volatile race to succeed Gov. Dannel P. Malloy, a Democrat who won eight years ago in a race so close that the results were not clear for three days after the polls closed. Only 4 percent of likely voters remain undecided in the Quinnipiac poll, but 13 percent of those who preferred a candidate for governor said they might change their mind in the next week. Unaffiliated voters, which are the largest voting bloc in Connecticut, favored Stefanowski over Lamont, 43 percent to 38 percent, with 13 percent for Griebel. But Democrats outnumber Republicans in a state that has been solidly blue in federal elections for the past decade, while competitive in open gubernatorial races. “The race is close among independent voters. For Bob Stefanowski to pull ahead, the Republican must do better among this key swing group in blue Connecticut,” Schwartz said. Griebel’s support was soft in the poll. While 90 percent of voters for Lamont and Stefanowski said they were committed to their choices, half of Griebel’s supporters said they could change their minds before the election on Nov. 6. “Oz Griebel is no longer in double digits. Will he end up fading by Election Day, as often happens to third party candidates? If so, that could end up benefitting Democrat Ned Lamont, who is the second choice of Griebel voters,” Schwartz said. Griebel, the former leader of the MetroHartford Alliance, was endorsed over the weekend by the Hartford Courant. The telephone survey of 1,201 likely voters was conducted over six days, ending Sunday. It has a margin of error of plus or minus four percentage points. Lamont has a 21-point lead among women and 12-point lead among college educated voters, while Stefanowski has advantages of 13 points among men and 21 points among voters without college educations. Non-white voters favor Lamont over Stefanowski, 63 percent to 28, with 6 percent for Griebel.